DOOR REPAIR SERVICE - YOU DON'T NEED A NEW DOOR!! If your door has jammed in the shut position, it doesn't mean you need a new door! I can open jammed doors and get your stiff door working like new again. By offering a UPVC door repair service, I carry a large selection of UPVC Door Lock parts which often enables me to carry out a first time fix for your lock problem, thus getting your door working quickly, and at an affordable price. If your door is old and you've been told the parts to fix are not available anymore then I can source upgrade and replace your old locking mechanism for something better that will lengthen the lifespan of your door. 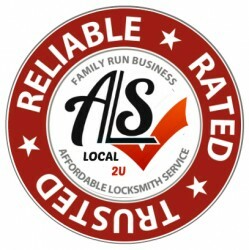 Affordable Locksmiths specialise in all manner of Upvc door lock problems and Multipoint Locking Mechanism. Whether you need new keys, you have a broken door, need to open a jammed door or wish to upgrade your security, give me a call and I will be happy to discuss the options with you. This is not the lock. The lock is only the lock barrel that is operated by the keys. The locking mechanism runs down the length of the side of the door and in most cases is engaged when the handle is lifted and the locking points engage. Because of their nature, the slightest misalignment of the door or the receivers in the frame, can cause the Multipoint Locking Mechanism to become stiff, which leads to extra wear and tear and possibly a broken door. In some cases realigning the door when the first signs of misalignment occurrs can prevent costly failures resulting in a broken door. A.L.S. UPVC door repair service can also upgrade older, lower security Multipoint Locking Mechanisms, to newer higher, security versions at the fraction of the cost of a new quality door. Affordable Locksmiths UPVC door repair service can save you money. By getting your badly locking door looked at now I could save you the cost and inconvenience of UPVC door repairs at a later date and the cost of a new door. So if you need a local, Affordable UPVC door repair service in Glasgow.